So, wisdom teeth out! Ouch. I’m feeling much better now, and maybe I’ll actually start posting again. (Driving in Japan part 2 is still hanging out around here somewhere…) Somehow I knit something while I was spaced out on painkillers, though, and I thought I’d share a picture! Pretty cute for drugged knitting, right? A friend of mine is having a baby girl but doesn’t want to go in for ruffles and flowers, and I thought she’d like it. (She did, actually, I gave it to her tonight and she thought it was awesome.) If you want to make your own the pattern is free over at Coffeebra. I used size 6 dpns and Lion Brand Wool-Ease in Oxford Grey, Dk Rose Heather, and Rose Heather. It was fast and fairly easy, but if I make it again I won’t be joining the brim as directed. 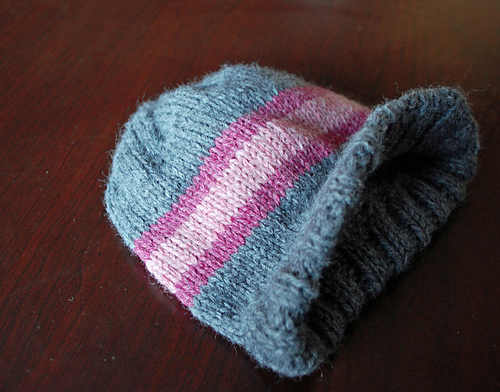 In the pattern you’re supposed to knit the ribbing, then fold it up and knit together around to form a casing, inserting the brim as you go, so that your brim is all done once you get to the stockinette. Clever, right? Well, yeah – but knitting the cast on edge and the live stitches together was a pain, even worse where the brim was, and it made it hard to knit the stockinette above the brim for abour five rows, as well. I think I’ll stick to sewing up the brim at the end. Cute hat! I hated getting my wisdom teeth out. I was out for days. So painful. I couldn’t have imagined getting them out and having to take care of small children.